If any Disney characters know how to rock purple, it's the villains. 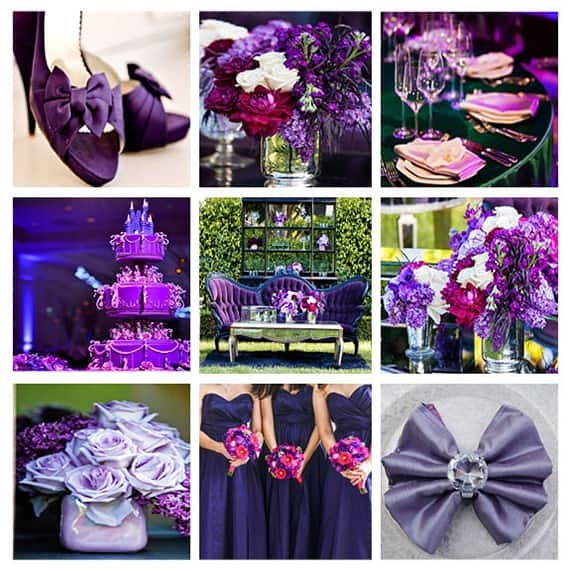 So in honor of the Villains Unleashed event at Disney's Hollywood Studios this weekend, I've created a mood board inspired by a devilishly dazzling display of purple. While purple is the go-to color for most villains (think the Evil Queen, Maleficent, Ursula and even Yzma), brides can easily incorporate hues into their decor for a hint of evil...and a whole lot of good style. And in true villain fashion, you can always throw in a hint of complementary green (with envy). I truly love this! My fiancee and I want to do a Disney Villain theme, because they are our favorites haha.